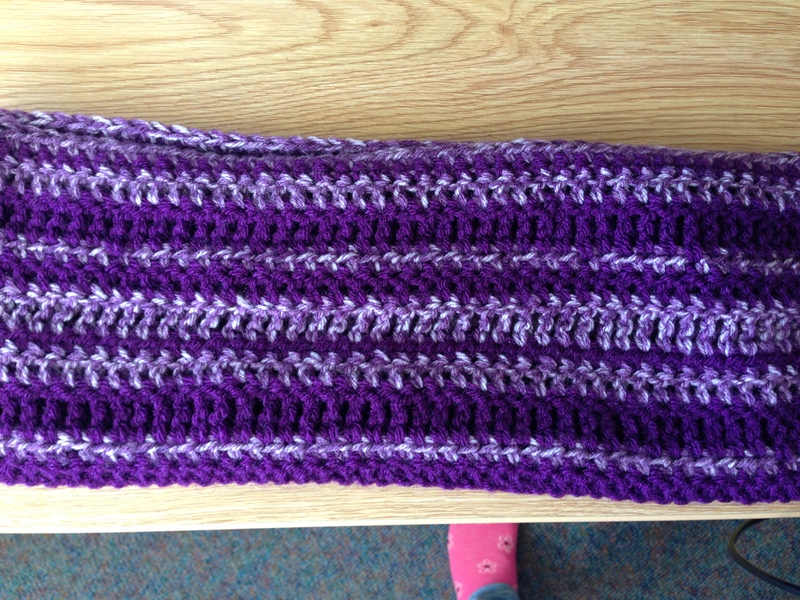 Here’s a pattern for a very simple infinity scarf. Basically, you need to make a giant chain, join it, and add rows of whatever stitches you want, with whatever colors you want. It’s a fun scarf because you can easily make it your own by changing the colors, types of stitches, number or rows, etc. If you’re a beginner, now’s your chance to pretend you made your own crochet pattern! If you want to share this, please link to this page or the corresponding Ravelry page. Ending a row requires a slip stitch. If you’re about to change colors, use your next color for the slip stitch. DC row: Still with color 1, ch 3. This small chain counts as your first dc. Dc in each ch around. (I just used the back loop of each ch.) Join to your first dc (the top of the small chain) with a slip stitch. Make sure your scarf is still the length you want it to be. If it looks too long or too short, you may want to undo that row and change the length of your chain. HDC row: With color 2, ch 2. Hdc in each dc around. Join with sl. TC row: With color 1, ch 4. Tc in each hdd around. Join with sl. Repeat rows 2, 3, and 4, but with colors 2, 1, and 2, respectively. Repeat rows 2, 3, and 4, with colors 1, 2, and 1. DC row: With color 2, ch 3. Dc in each tc around. Join with sl. HDC row: With color 2, ch 2. Hdc in each sc around. 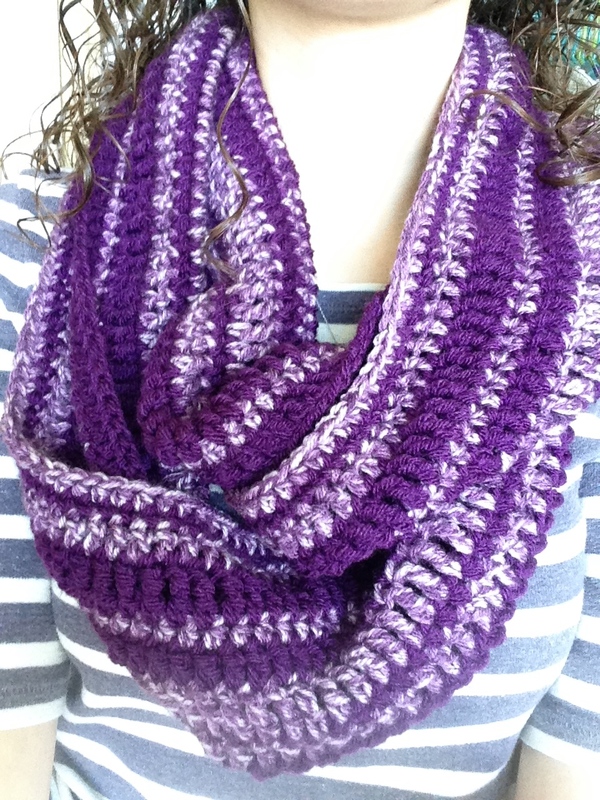 This entry was posted in Crochet and tagged crochet, free, infinity, scarf. Bookmark the permalink.